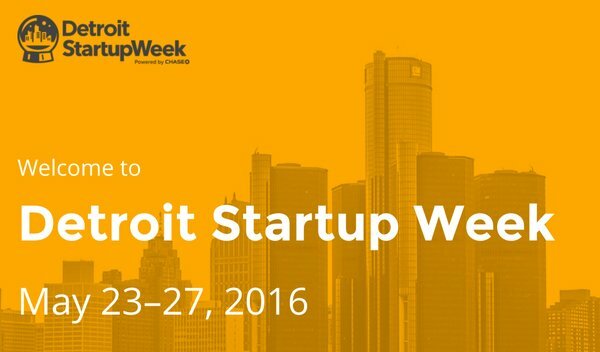 Detroit’s inaugural Startup Week™ will be the largest first-year event in the global brand’s six-year history. “Our city is unlike any other, with both ingenuity and a welcoming spirit, brilliance and grit, and opportunities abound. Detroit Startup Week™ is designed to glue together those opportunities, celebrate what’s already working, and lay the groundwork for what’s to come,” said Kyle Bazzy, lead organizer. Detroit Startup Week™, powered by Chase, celebrates and supports entrepreneurship in Detroit and beyond. All activities are free and startups, entrepreneurs, and enthusiasts are all welcome to attend to amp up their business skills, networks, and knowledge of opportunities in Detroit and the region. Ten learning tracks will be offered to entrepreneurs at all levels: technology, entrepreneurship 101, mobility, music, food-preneurship, art+design, civic innovation, neighborhood collaboration, social entrepreneurship and the Internet of things (IoT). "More than a century ago, Ford Motor Company was a startup business that applied innovative thinking and collaboration to get where it is today,” said Bill Ford, executive chairman, Ford Motor Company. "We are proud to support the next generation of entrepreneurs at Detroit Startup Week who embody that same spirit." Sessions aligned with the ten tracks, including fireside chats and panels, networking opportunities, happy hours and even free headshots for entrepreneurs will round out the week. Events will take place all over the city at venues that include Civilla, Grand Circus, Techtown, Bamboo Detroit and more. Event headquarters are at the historic Masonic Temple, known for the week as #ChaseBasecamp. To learn more to register for Detroit Startup Week, visit http://detroit.startupweek.co. Startup Week™brings entrepreneurs, local leaders, and friends together over five days to build momentum and opportunity around Detroit’s unique entrepreneurial identity. Detroit Startup Week is led by entrepreneurs and hosted in entrepreneurial spaces all over Detroit. Tracks include technology, entrepreneurship 101, mobility, music, food-preneurship, design/art, civic innovation, neighborhood collaboration, social entrepreneurship and the Internet of things (IoT). This Techstars initiative can be found in dozens of cities worldwide. Detroit Startup Week is powered by Chase and made possible by Ford Motor Company, Butzel Long, Microsoft, Liquor 43, Opportunity Detroit, Telemus, Social Enterprise Alliance Detroit, Billhighway, Solidea, Pixo Group, Detroit Regional Chamber and Verii. To learn more or register, go to http://detroit.startupweek.co.